Time for the pond netting to come down? 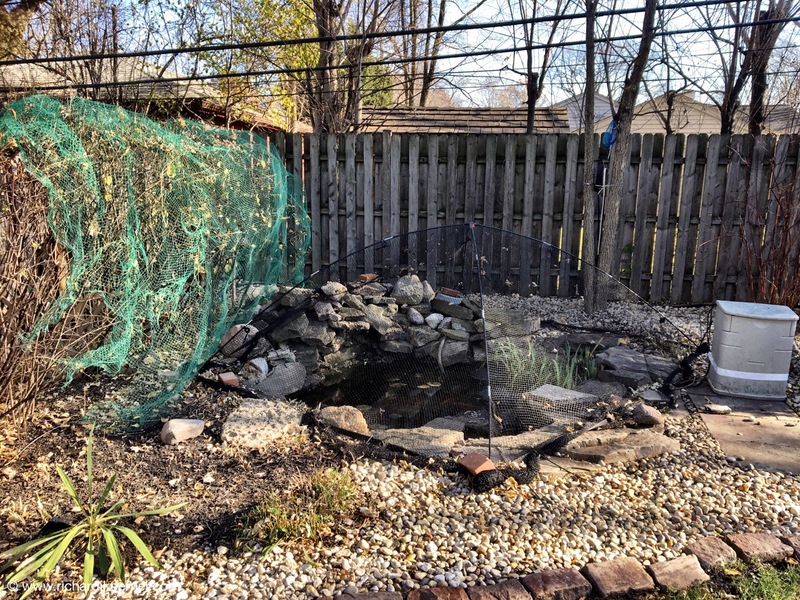 It is a no win question, when to take down the netting over the pond. This year has been one of the easiest and best years of pond coverage. The pond looks pretty good, is pretty clear, and I think it is ready to face the winter. I am thinking yes. Despite what we say, in many ways we northerners or Midwesterners have a perverse liking for the change in seasons. I love the way the snow cleans up the driveways and sidewalks, removing some stains that have been there for a long time. I like the way that much of the leftover vegetation is composted by the weather. I often think that a cold snap is a way of killing off germs. I doubt that this is the case. I guess I can dream. I can also dream that the current régime be taken down. What with Flynn lying to the FBI and all, perhaps my thoughts that this happened to be an illegal election might come to some sort of fruition and the nightmare that is devastating our country might come to an end. My fantasy is that the progress that we have made that was repealed by the current régime will be turned around and that instead, we will come to our senses and move forward, not backward. Anyway, the day is beautiful and although near freezing when I walked Stewart, it was nice. The sun is shining. All of the grandkids are healthy. That is good and given the recent months, a huge gift. The oldest son and I are still dealing with the lingering cold and I am truly ready to be done with it. This entry was posted in Life in general, Politics, Pond and koi, Thoughts and philosophy, Uncategorized. Bookmark the permalink.